We are excited to introduce our NEW MENU to you! Morgans is celebrating the 70's! Join us for the music, drinks and cuisine of the 70’s! 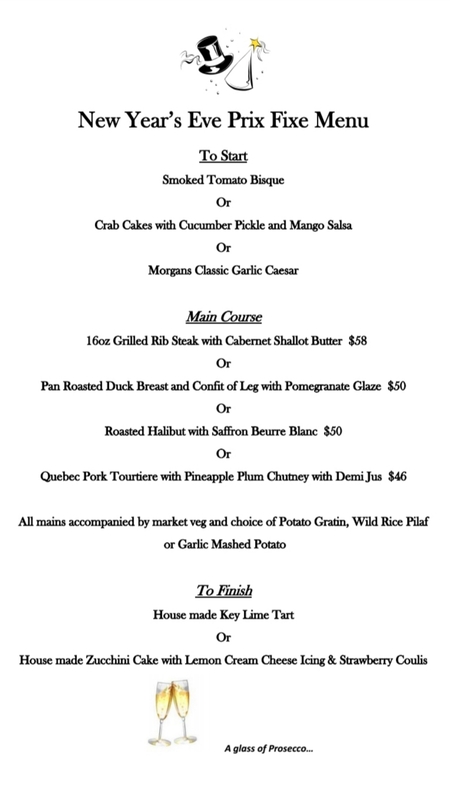 New Year’s Eve Prix Fixe Menu (including a glass of Prosecco) or regular menu! Join us for the festive season with friends, family or work! We offer regular or Event Menus. We are turning 7! How times flies. Wish us a Happy Birthday on any visit that week and on your first round of drinks, you will receive our $5.50 Pint on all Craft Beer and $7 on our Pinot Grigio and Merlot Imported Wine! Join us for a special Thanksgiving Dinner on Sunday, October 07th, 5pm - 9pm and Monday, October 08th, 5pm to 9pm. Join us for the East York Mental Health Fundraiser. 10% of Food and Beverage Sales will be donated to Alternatives Mental Health Programming. Please come enjoy the wine, beer and food and support this very important and worthwhile cause of mental illness.